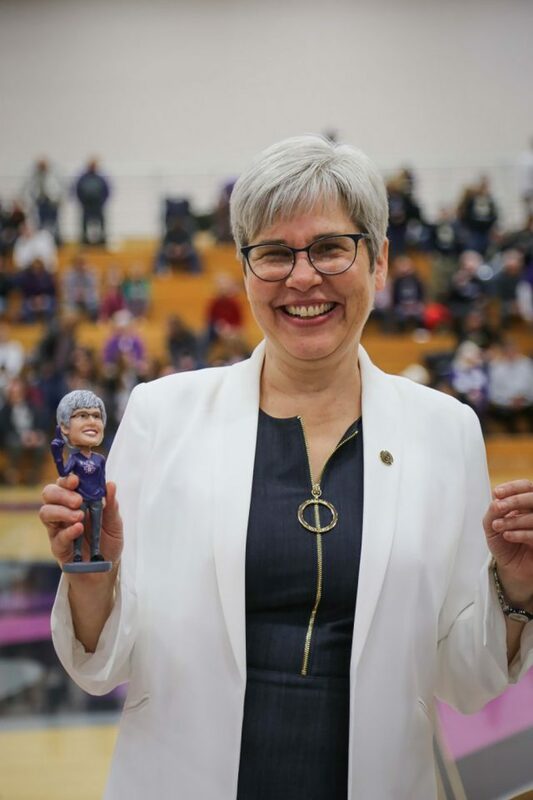 A new era was ushered in as Dr. Rebecca Stoltzfus was officially named as Goshen College’s 18th President on Saturday, Feb. 17. During the weekend, there were three main events that propelled Stoltzfus into office. The weekend kicked off at 10 a.m. on Friday with a special convocation that was planned in part by Stoltzfus herself. Duane Stoltzfus, professor of communication and chair of the Goshen Core, introduced President Stoltzfus to the students and faculty that were gathered. Stoltzfus then proceeded to lead a panel which featured four different people, all of whom are alumni of Goshen College. The panel consisted of John D. Roth ‘81, professor of history, Karina (Flores) Lopez ‘17, multimedia journalist at WNDU, Beverly Lapp ‘91, professor of music, and Dominique Burgunder-Johnson ‘06, director of marketing. All four panel members talked about their experiences with community and finding themselves within the context of that community. The content of the panel reflected the “distinctively Goshen” theme of the inauguration weekend. The next Stoltzfus event was Stoltzfest — an evening of music, poetry, games and food — which kicked off at 7 p.m. The fest took place in the Roman Gingerich Recreation-Fitness Center. Bouncy castles and minute-to-win-it games filled over half of the gym. While people weren’t bouncing, they enjoyed food from the four vendors that were spread out around the edge of the other half of the gym. Food from local restaurants like Maple Indian, Sergio’s Cafe, Memories of China, and Angie’s Boomchickapop popcorn were able to to be “purchased” with tickets that attendees received at the door. In the same half of the gym where the food was featured, a stage presented many student artists and performers. The night of music ended with a performance by The Eighth Day, a band consisting of Steven Lowe, Janell Preheim, Nathan Berkey, Alexander Seymour, Lucia Martinez, and Simon Hurst, all first-year students. With Saturday came the inauguration of President Stoltzfus, which started at 10 a.m.
Pre-service music welcomed people into Sauder hall. The music then switched over to the Goshen College Symphony Orchestra playing “Variation on a Shaker Melody” as a processional of Goshen College professors filled the choir balcony and the delegates from other colleges filled front two rows of Sauder hall. After the processional, there was a welcome by the international students, who were dressed in their traditional dress from their home countries. Five students then did a dramatic reading titled Goshen Voices I, sharing the stories of alumni written by Don Yost. Dr. Conrad Clemens, chair of Goshen’s Board of Directors, welcomed everyone who was in attendance either in person or over livestream. Rev. Dr. Rebecca Dolch, former pastor of St. Paul’s United Methodist Church in Ithaca, New York, gave the invocation. This was followed by a commissioned poem titled “Song of the Maples” written and read by Shari Miller Wagner, winner of the the 2016 and 2017 Indiana Poet Laureate. Later on in the program the presidential installation took place. Clemens gave the installation charge and James Brenneman, former Goshen College President, gave President Stoltzfus the Presidential Medallion. After the installation, President Stoltzfus gave her inaugural address. Stoltzfus stressed the theme of “distinctively Goshen,” stating that she will be behind students and faculty. When the event was over President Stoltzfus noted the change she felt.